ParcelSurveyor® provides a time and cost efficient survey solution without compromising accuracy. 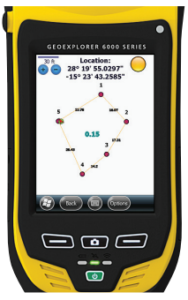 MEDEEM’s survey teams use Trimble GEO 6000 GPS devices equipped with MEDEEM’s customized ArcGIS for mobile software application to collect highly accurate parcel survey data in remote field environments. Survey measurement data is then uploaded to Arc Map and migrated to the parcel fabric for validation and automated report production. MEDEEM’s ParcelSurveyor™ process is able to complete survey workflow and map production over 10 times faster than traditional survey production methods.